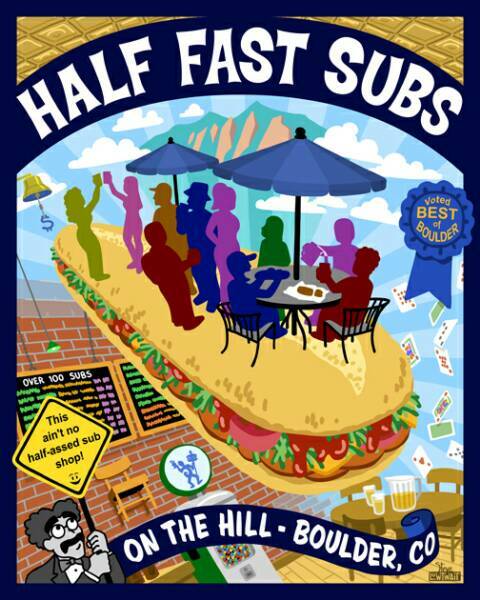 Half Fast Subs is that rare restaurant concept, a fast casual joint that is highly successful with years of experience (19) and yet that only has one location – right here on The Hill in Boulder. The most amazing thing about Half Fast Subs is its menu, which has exactly 100 options on its menu (at least according to the online version I counted). 100 sub choices! That alone makes Half Fast Subs worth visiting. Even better, the menu is organized so it is pretty easily digestible within a few minutes, with all subs listed in either blue (cold) or red (hot) and broken into major categories including Cheesesteaks, Stuffed Subs, From the Sea, Vegetarian, and Meat Specialties. This restaurant probably gets passed over by many Boulderites because of its location on The Hill and its associated student vibe. Yes, it attracts mostly students and a crowd of partiers during happy hour, there to slurp up the Long Island Iced Teas. But the crowd is never unruly or even impolite, with both staff and patrons very welcoming to everyone from families with a toddler to men in business suits, if you can find someone like that in Boulder. The quality of subs is excellent, with each sub made to order, and your only task is to select a sub out of the 100 on offer that makes your mouth water.